Leuven monthly 2 was held on February 24th by 8 players. Johan S. and Alain finished the games with the perfect score of 30 points. The next Leuven Monthly is on Sunday, March 24th. Looking forward to seeing you there. We got together at 27th of January for the first Leuven Monthly of 2019. There were 11 players, and the winner was Charlie with 3 wins (score of 30). Following him were Kristoffer, Liliane, Alain, and Toon with 2 wins (score of 23). 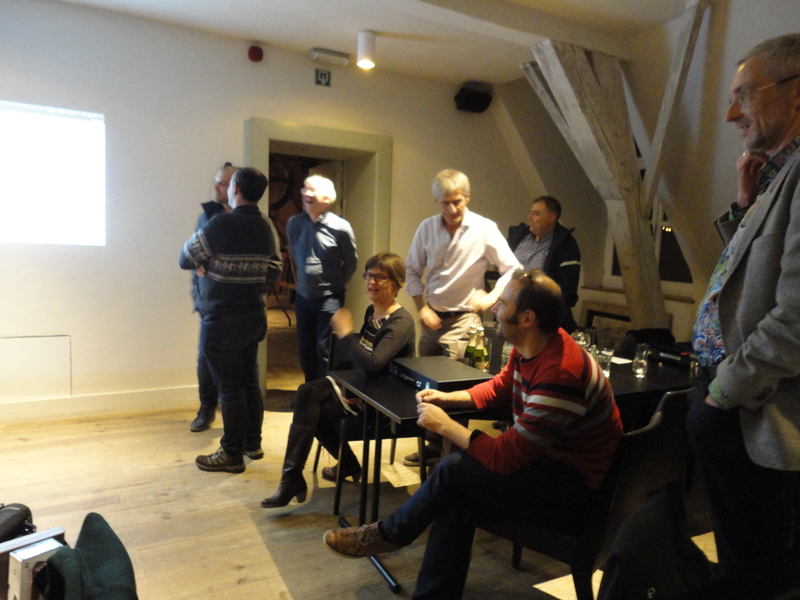 Looking forward to seeing you in the second Leuven Monthly on 24th of February. If you’re new to the club, feel free to contact the tournament organizer, Henri Pollet at henri.pollet@belgacom.net for more information. Yes, we’re back for a new Leuven Monthly series! The format in 2019 will be largely the same as last year. One difference: on Sunday afternoons, we will play three 7-point matches, instead of two 7-point matches and one 5-point match on Friday evening. Just winning a single season already qualifies you for the semi-final of the Club Championship 2019 in December. We start at 13:45 on Sunday and at 19:45 on Friday. We continue to play in Squash Club De Vaart, Kolonel Begaultlaan 15, 3012 Wilsele, where drinks are cold, tables are big, and smiles are for free. Your tournament director will be the one and only Henri Pollet (E: Henri.Pollet@belgacom.net; T: 016 29 05 33). See you at Leuven Monthly’s! On Sunday, December 9, 2018, the final of the Leuven Club Championship took place in our familiar venue, Squash Club De Vaart in Wilsele. Alain, Johan S., Nader and Toon were qualified for the semi-finals. Johan defeated Toon and Alain to become our Club Champion 2018. Congratulations! Runner-up was Alain. In the small final, Toon defeated Nader to win the third cup. 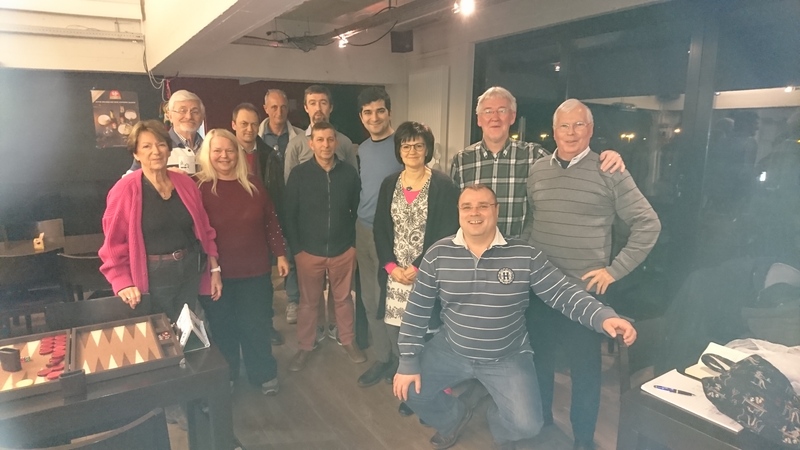 Organizer and participants of Leuven Monthly 10, on December 9, 2018, in Squash Club De Vaart in Wilsele. Thank you to everybody and hoping to see you in 2019 for a new Leuven Monthly series! We hope you enjoyed the Leuven Monthly series in 2018. Thank you to all participants and congratulations to the finalists! A big thanks also to the friendly staff of the Squash Club De Vaart for their hospitality, patience, and great service, and for the space they so generously provide to us. On 25th of November the 9th Leuven Monthly games took place with 10 players. This concludes the autumn games, and the champion of this month is Toon Van Herreweghen. Also, Alain Chif has gained the highest total score for the three sessions. The semi-final and final games among the three session champions and the champion of total score will be held on 9th December and everyone is welcome to join us. In the semi-final games, Nader plays against Alain, and Johan S. against Toon. Both the semi-final and final games are 9-point matches. And finally, we’d like to congratulate Alain and Charley for being present in all Leuven Monthly games. On Sunday, November 11, 2018 thirty participants came together at the Abdijmolen, Heverlee, for the 10th Leuven Open. The tournament was played according to the Swiss system, comprising 7 rounds of 5-point matches, with clock. On paper the strongest player of the pack and already winner of the 3rd and 4th editions in 2011 and 2012, Michel Lamote won all matches and the tournament. Then followed a group of seven players with 5 victories out of 7 matches. The tie-break system based on resistance points declared Sassan Kachanian as 2nd and Paul van Dijke as 3rd. Congratulations! In the Fonske team challenge, the team from Brugge (Michel Lamote, Paul van Dijke, Paulus van Rooijen, Johan Swyngedouw and Guy Van Middelem) scored 21 victories out of 29 inter-team matches, a success rate of more than 72%. The highest number of victories was scored by Leuven, the largest team. Following tradition, the club offered bottles of champagne to those unfortunate enough to dance with 66 on a one-point board. At the end of the day, 13 of 20 bottles had found an owner, with some players having “won” more than one bottle. The remaining bottles were easily dispatched with as well. Sesame Street characters Bert and Ernie accompanied those needing a dose of luck. At the end of the day, they went home with Odette and Jan. We hope they’ll bring many fortunate dice rolls and moments of joy and fun to their new bosses! Thank you to everybody for participating! See you in 2019 next year for the 11th Leuven Open. Leuven Monthly 8 took place on 28th of October with 11 players. We also had the pleasure of welcoming a new player, Ana-Maria. After the usual 3 rounds, Toon and Dan shared the first place with maximum score. Looking forward to meeting you in Leuven Open 9 on Sunday, 25th of November. There were 17 players in Leuven Monthly 7 on 23rd of September, among which we welcomed Marin Alexe, who was coming for the games from Maaseik. Besides Marin, we’ve had the pleasure of meeting two other players for the first time in Leuven: Nick from Gent and Lorenzo from Brussels. Nick shared the first place with Alain, one of our most loyal players. Following them, Odette, Charly, Toon, and Johan Brissaert got the second place by winning two out of three matches. There are two more games before we have the final champion of this season. Looking forward to meeting you in Leuven Open 8 on Sunday, 28th of October.